Forceful coughing or vomiting may cause petechiae of the face. Measles is a notifiable illness and notification is required based on clinical suspicion. Incubation period is approximately 7-21.nfectivity is several days before the onset of the symptoms up to four days after the appearance of an erythematous maculopapular rash. 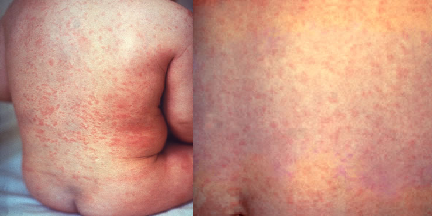 Children diagnosed with measles should be kept off school until 5 days after the appearance of the rash. Current MMR vaccinations are administered at 12-15 months of age and 3 to 5 years of age. Scarlet fever is a notifiable disease and notification is required based on clinical suspicion. Complications: Sinusitis, mastoiditis, peritonsillar abscess, pneumonia, meningitis, osteomyelitis, septic arthritis, cerebral abscess. Septicaemia, myocarditis and toxic shock-like syndrome. Glomerulonephritis and acute rheumatic fever. 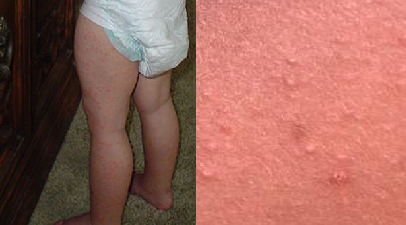 spread by airborne transmission or droplet spread from 7 days before to around 7 days after the onset of the rash. The incubation period is around 2 weeks after which a prodrome of headaches, fever and lymphadenopathy occur. Rubella is a notifiable disease and notification is required based on clinical suspicion. Children diagnosed with rubella should remain off school for at least 5 days following the onset of the rash. The virus is predominately spread in respiratory droplets but can also pass from mother to foetus and in blood transfusions. The incubation period for erythema infectiosum is usually between 4 and 14 days but can be as long as 21 days. The infectivity period commences at exposure and lasts until the symptoms appear, i.e. at 4-14 days. Investigations: IgM antibodies appear around 10 days post infection and remain detectable for up to 2-3 months. IgG antibodies appear at about 14 days post infection and remain for life. High fever (3-4 days), then a characteristic rash, which appears as the fever disappears. The incubation period for exanthem subitum is from 5-15 days. Incubation is from 10 to 21 days. The period of infectivity is from the time when symptoms first appear until all lesions have crusted over. This is usually around 5-6 days after the onset of the illness. Most crusts will disappear by 20 days. The risks to the mother are the highest in the third trimester and the risks to the foetus are the greatest in the first and second trimester. Varicella zoster immunoglobulin should be given to neonates whose mothers develop the rash 7 days before or 7 days after the delivery, to reduce the risk of severe neonatal Varicella. Neonates presenting with a chickenpox rash should be admitted for aciclovir. The peak prevalence is in children aged 4 – 6 years. patients have a preceding upper respiratory tract infection (URTI). causes reddish-purple purpura on the backs of the legs, buttocks, trunk, and back, and may be associated with joint pains and swelling (especially in the knees and ankle), and gastrointestinal symptoms. 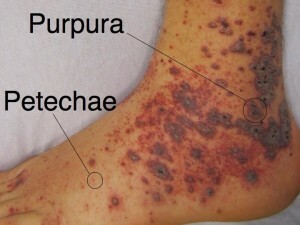 Abdominal pain and bloody diarrhea may precede the typical purpuric rash. HSP may also cause nausea and vomiting. Renal involvement occurs in 50% of older children may progress to end-stage kidney disease. Other rare complications include myocardial infarction, pulmonary hemorrhage, pleural effusion, intussusception (in 2-3% of patients), gastrointestinal bleeding, bowel infarction, seizures and mononeuropathies. Features depend on the level of clotting activity, and include spontaneous haemarthrosis, especially of the knees, ankles, and elbows; and muscle haematomas in severe haemophilia. Increased or delayed bleeding with injury or postoperatively is typical of milder disease. The most common inherited coagulation disorder, with an incidence of up to 1% in the general population. Inherited as an autosomal dominant disorder (equally common in males and females). Typically presents with mild to moderate mucocutaneous bleeding, such as nosebleeds, menorrhagia, or prolonged bleeding after surgical incisions or dental procedures.